We need to catch up on the New Acquisitions and bequeathments since Robbie's birthday. On behalf of Marybeth's special birthday, she is probably 'expecting' something extra special. And here it is... a vintage NF Lil' Lion from the Circus Animals series. This is our first acquisition in this series that came out in 1969 . We hear Daniel Boy likes to roll with trucks. This is a brand new 2010 CVS TRUCK in the Hauler Series donated to the PEZ Museum in honor if his first birthday. In honor of Jason's 30th birthday and the all-seeing wisdom of this venerable age the donation is made to the PEZ Museum of two retro Psychedelic Eyes the rare Black Hand and the very rare clear, crystal hand. 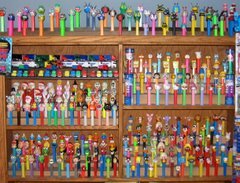 In honor of Sarah's birthday a donation is made to the PEZ Museum of the latest, and unique Disney Fairy - Terrance. As Sarah flies off to college she hopes to find other boys in a "Fairy - tell" like manner. Every little girl likes fairies and so in honor of Elizabeth two Disney Fairies - Fawn & Rosetta are donated to the museum. Issued in 2009 they finally, thanks to Elizabeth join the other 6 fairies already in the collection. In honor of fun, family man Dallin two rare and hard-to-find (HTF) Pez Keychains are donated to the Pez Museum. Bart & Marge give Homer (already in the collection) a family with whom to be. Thanks dad for remembering Dallin and Elizabeth. Can't wait to see them in person. Whoa. that is a lot of birthdays in a short amount of time. I think that Mb was excited to see her NF PEZ contribution. That one was really cool. All the others seem to be a great fit to a great collection. I have only seen them (Thomas the Train) for $1.99 at Pavilions. I'm sure they will show up somewhere for a lot better than that.